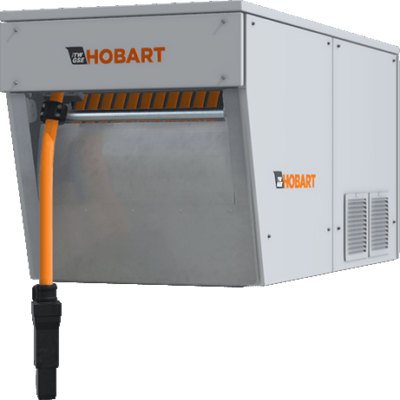 The Hobart 2400 Power Coil includes a 400 Hz, 90kVA frequency converter with a cable reel all in one enclosure. The unit provides a simple easy to use cable retriever system allowing the operator can safely stow the cable to prevent hazards on the ramp or in the hanger. The Power Coil uses the latest in frequency converter technology to provide the user with clean 400Hz power at the push of a button. The unit can be operated via the easy to use digital control panel, or through push buttons on the cable head to allow for remote operation. The Power Coil can be bridge mounted as well as stationary mounted for hangar use.